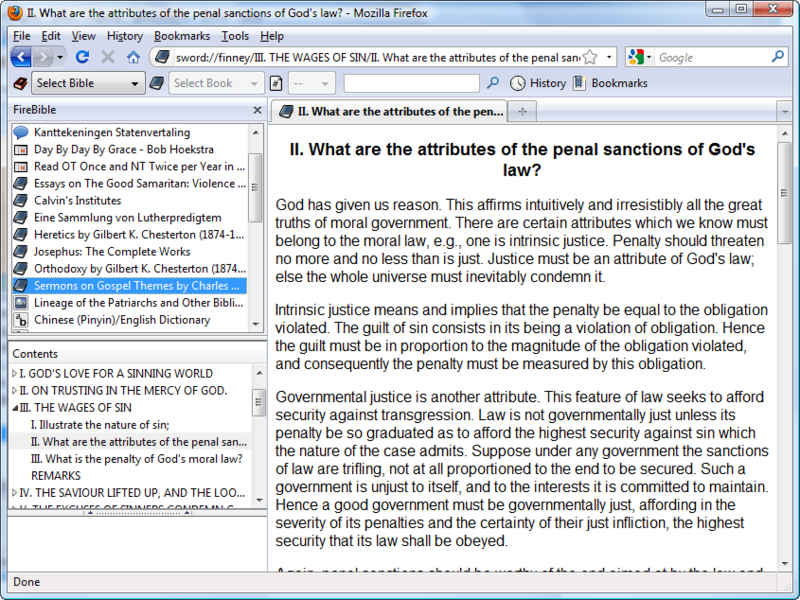 FireBible is a free Bible study tool for Firefox. Read Bibles and other biblical material in languages ranging from English to Arabic, Hebrew and Chinese from the comfort of the Firefox interface you are already familiar with, even when you’re offline! FireBible will work on Windows and Linux, for Firefox versions 26 and above. 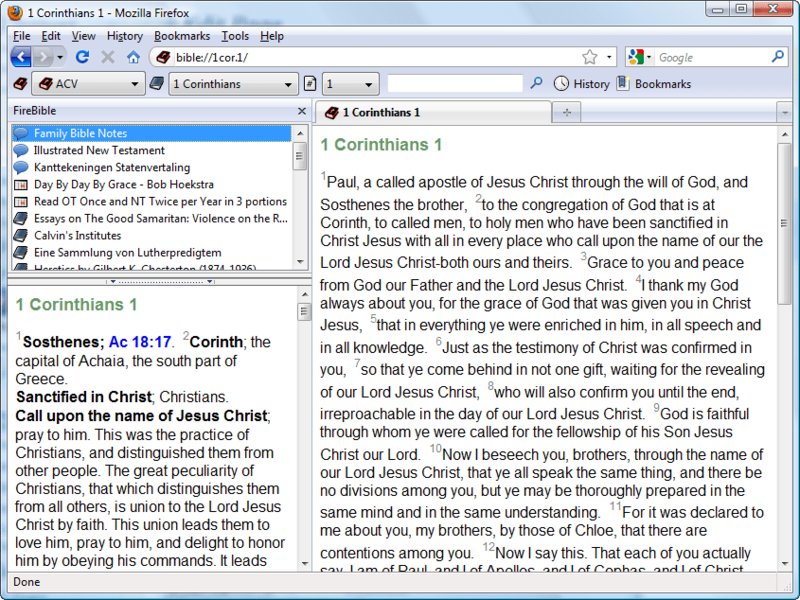 Supports multiple versions of the Bible in multiple languages. View multiple Bibles side by side for easy comparative study. Supports General Books, Commentaries, Daily Devotionals, Dictionaries, Glossaries, Maps and Images. Supports Strong’s words and word morphology. Ubiquity support for fast verse lookups and use. Displays linked reference notes if available. Adds the “bible://” and “sword://” protocols to Firefox, clicking such links in Firefox will immediately load the corresponding content in the browser. FireBible is URL based, so you can bookmark and tag chapters, verses and even search results. Integrated with Firefox’s browsing history, go back and forth between passages easily. Leverage the awesome bar to quickly navigate to recently browsed or bookmarked pages; open locations by simply typing in the page title. Highly detailed and categorized history and bookmark lists available. Internet connection only required to download new material; all installed material can be accessed when offline. FireBible uses Crosswire’s open source SWORD technology and modules, making a wide range of Bibles, General Books, Commentaries, Daily Devotionals, Dictionaries and Glossaries, Maps. Click here to install the FireBible extension. You may be informed that software is being installed, in this case, please Allow thegoan.com and try again. Alternatively, right click, choose Save Link As… and save the XPI file locally. Open this file in Firefox (File > Open File…) to complete the installation. Restart Firefox and you should now see the FireBible toolbar. Click Select Bible on the FireBible toolbar and FireBible will ask you to download LibSword. Click OK to automatically initiate the download and installation of this library. I do not distribute this library with FireBible because it allows me to ship a single OS independent version of the extension and Mozilla insists that the user should explicitly opt-in when native libraries are used. This library is also used by XULSword and is totally safe. FireBible does not contain any Bibles or biblical material, so you need to download and install them before being able to use them in FireBible. For now, you must do this manually, I will be adding a module manager to FireBible in the near future. Go to the Crosswire Bible Modules page. Scroll through the list and download the module you want from the Raw ZIP column, you can download as many Bibles as you like. You can also download other types of modules like Commentaries, Dictionaries, General Books, etc. (click on the appropriate category on the left). Click the Install Modules button on the toolbar or on the FireBible preference page and point to the ZIP files you downloaded (you can select more than one at a time) – FireBible will install them and make them available in the UI. Download ZIP modules as described above and unzip them all to a single, convenient, location. Next, go to Tools > FireBible and add the folder into which you unzipped your modules to the Module folders list. Click OK and FireBible will refresh and pick up any modules it locates in the specified directory. You can unzip multiple modules into the same directory and add multiple directories to the list. Hit Reload Modules if you want FireBible to re-read the list of modules in a given directory (otherwise automatically done on restarting Firefox). FireBible will always pick up modules unzipped at <user_home>/AppData/Roaming/Sword (Windows) or <user_home>/.Sword (Linux). Use the first combo to select a Bible, the second to select a book and the third to select a chapter, FireBible will then look up the text and bring it up in the browser tab you are currently using. If no installed Bibles are found, FireBible will not have any data to work with and you will see a warning prompting you to install modules (see Downloading Bible Modules above). on the FireBible toolbar to open the FireBible sidebar. Select the module you need from the first section and the chapter from the second section to have the contents displayed in the browser. Dictionaries, Glossaries and Daily Devotionals will display their contents in the third section. Commentaries selected in the sidebar will automatically display content corresponding to the last Bible verse read. If you open a new verse, the commentary will be automatically updated. By default, commentaries are not displayed in the Bible toolbar, but you can change this preference on Display preference page allowing you to specially navigate commentary content. When you use the combos on the FireBible toolbar, observe the URLs being loaded into the browsers address bar. You can bookmark or tag these URLs just like any other URL. They are also recorded just like any other site you visit in your browsing history and you may use the back and forth buttons or the History pane to load these locations. You can visit previously loaded content by simply typing in parts of the title into the address bar. If you go to a bible:// URL directly without selecting a Bible from the first combo, the default Bible will be used to load the corresponding content. If a default Bible has not been set, the first Bible in your list will be used. 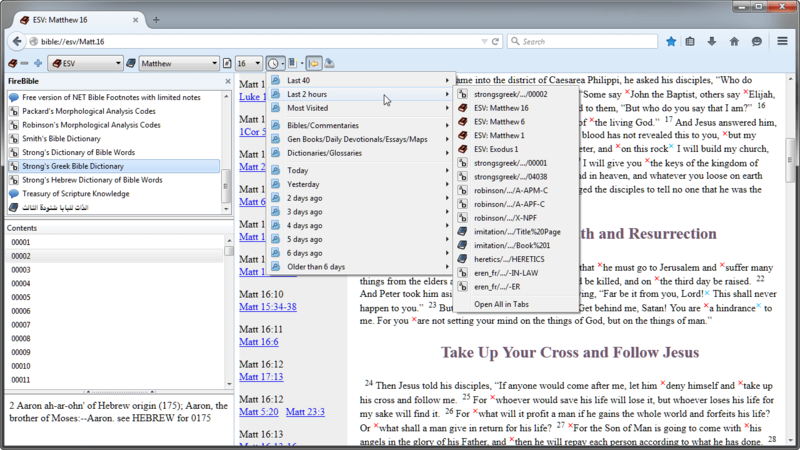 To set the default Bible, go to Tools > FireBible > Display and select a Bible from the list. The history and bookmark menus will display both categorized and un-categorized content. All elements in these lists are created using Firefox 3’s places query syntax.You can add your own queries to these toolbar items by creating new queries and placing them in the Bookmarks > FireBible 2 History and/or FireBible 2 Bookmarks folders. Any changes made to these folders will be reflected in the history and bookmarks menus on the FireBible toolbar, so you can modify any preset queries in this location or simply delete queries you don’t find useful. If these folders are deleted, FireBible will re-create them with default content when Firefox is next started. FireBible 2 uses a “firebible” tag for all biblical URLs in order to correct issues with history and bookmark filtering code used in FireBible 1. If you used FireBible 1, you will not see previously read FireBible content in the history and bookmarks dropdowns. However, you can add the “firebible” tag to past bookmarks to have them appear. You may need to install this extension in order to edit the location property of existing smart queries in the Organize Bookmarks dialog. This is only necessary if you want to modify existing smart queries. By default, FireBible will add a FireBible toolbar to Firefox. You can use regular Firefox toolbar customization options to move the FireBible controls to another toolbar or disable the FireBible toolbar entirely – you can still use FireBible from Ubiquity and by typing in URLs yourself. Go to Tools > Options > Content, in the Fonts & Colors section, click the Advanced button and make sure Western is selected in the first drop down. You can then proceed to specify whether the text should be rendered using a Serif or Sans-Serif font, go ahead and select a font of the chosen family and specify the font size. Due to a bug in Firefox, only Western font settings affect the text rendered in FireBible, even if it is displaying text in a non-western language such as Korean or Arabic. Go to View > FireBible to bring up a number of items which allow you to change the way Verses and other content is displayed. In most cases, using Ubiquity to lookup a passage will be faster than using the FireBible toolbar or keying in the URL manually. You will need Ubiquity 0.6 or higher (maintained by satyr). To install, download this file and open it with Firefox. Observe the book suggestions change as you type m, a & t slowly. You could just type sword m 1 and scroll down to select Matthew from the presented list. You could also omit sword entirely and just type matthew 1 or matt 1; as the book name becomes more specific, the number of suggestions is reduced. You should now see the first chapter of Matthew in the preview area on the right. The preview shares its display settings (headings, verse numbers, notes, etc.) with the primary FireBible settings accessible from the View > FireBible menu. Continue to type from esv so that your input now looks like sword mat 1 from esv (replace esv with the name of a Bible version you have installed). The preview displayed will be from this version of the bible. If you change esv to acv for instance, then the acv will be used. You can use the long form of the Bible name if you wish, like from english standard and you can even specify the name of a commentary module. If the from parameter is not specified, then the default Bible (see FireBible preferences) or the alphabetically first Bible installed is used. Just press Enter to open that passage in Firefox. If you are in a text area though, the contents of the passage will be inserted into the text area (plain text or rich text depending on the type of text area). You could type to clipboard (your command will now look like sword mat 1 to clipboard or sword mat 1 from esv to clipboard), which would copy the passage to your system’s clipboard. Pasting to a simple text editor like Notepad would give you plain text. If you paste into a word processing application like Word for instance, you will get nicely formatted content. If you specify to firefox (sword mat 1 to firefox) and press Enter to open the passage in Firefox. This is the default behavior anyway, unless you are in a text area. Both the from and to parameters are optional, you could press Enter immediately after typing in the verse reference. The default behavior (Firefox or clipboard) on pressing enter can be set on the FireBible > Ubiquity preference page. Unlike FireBible 1, Multi-verse ranges are not currently supported mat 1:1-5,10,15-ff show you Matthew chapter 1, verses 1 to 5 only. I’ll be working on re-adding support for this in a future release. The content inserted in text areas or copied to the clipboard can be controlled on the preference page. 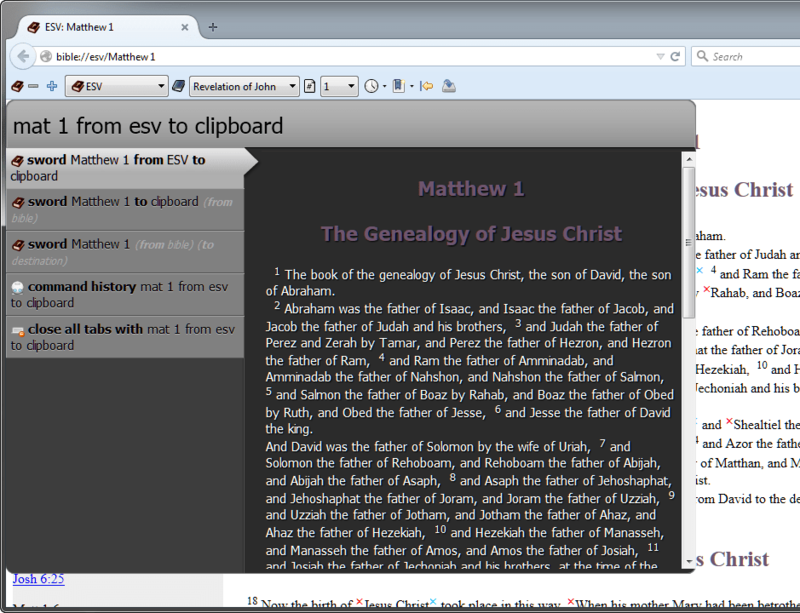 Content displayed in Firefox itself will continue to use the regular verse display preferences (View > FireBible). You should be able to omit the “sword” part of the command and start typing in your reference directly. In some cases, other Ubiquity commands may take priority over the sword command, in which case typing sword will help. An alternate name for this command is lookup bible. Any errors that occur while using FireBible through Ubiquity are only silently logged, no dialogs are displayed since they would interrupt Ubiquity’s functioning. Ergo, please make sure FireBible is working from the toolbar before attempting to use it through Ubiquity. FireBible does not need the FireBible toolbar to function, you can lookup bibles and verses exclusively through Ubiquity. I cannot install FireBible, an Error dialog pops up with an error code. This could be caused by reasons ranging from a corrupt download to a corrupt Firefox profile. See this article for more details on how these issues can be fixed. I cannot see any Catholic/deuterocanonical books in the the book list. Make sure you’re reading a bible which contains these books, FireBible will modify the book list based on the selected bible – the CPDV & DRC modules contains these books, for instance. How do I save the displayed passage to a file? Use File > Save Page As and select a location and a file name. Make sure you set the Save as type combo to Web Page, complete; Web Page, HTML only will not work. If you still can’t get FireBible to work, please type about:config into your address bar. Right click, create a new Boolean called firebible.debug.active, set it to true and then restart Firefox. Now attempt to use FireBible and observe the errors logged in the Error Console at Tools > Error Console (please select the All tab). This log will help me figure out what is gong wrong. Several bugs with more recent Firefox versions fixed. Supports Firefox 64 on Windows 64. Is now signed, future updates will be downloaded from addons.mozilla.org. Rewritten to work with native Sword libraries through XULSword, no dependency on Java. FireBible is now much easier to install, robust and marginally faster as well. Supports alternate versification (av11n) and thus deuterocanonical books. Does not work on OS X. Compatible with changes introduced in Firefox 16. Restored compatibility with Oracle’s Java 7 browser plugin. Fixed issue with Oracle’s Java 7 browser plugin. Compatible with Firefox 3.0 – 6. Can display multiple Bibles side by side. Added support for Strong’s words and word morphology. button for the FireBible sidebar. toolbar, highly detailed and customizable. Ubiquity support for fast reference lookups and use. easily identified in history / bookmarks / address bar. Devotionals added via FireBible sidebar. without the FireBible toolbar component. Version 0.5.1 First public version, only Bibles supported. FireBible 2 is built on the SWORD and XULSword libraries. Thanks to John Austin for doing all the heavy lifting with XULSword, and making the integration easier – John also hosts the XULSword library required for FireBible to function. FireBible 1 used the excellent JSword framework, currently lead by DM Smith; without JSword I would never have started working on FireBible. Sadly, this implementation had to be retired due to severe restrictions imposed on extensions which used Java by Mozilla / Firefox – this led to FireBible being broken for several years. 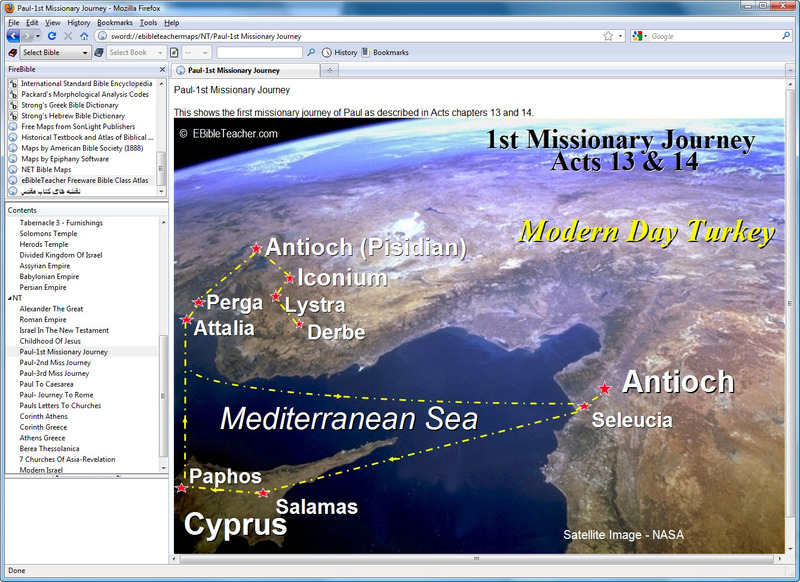 SWORD is CrossWire Bible Society’s fire Bible software project. JSword is a Java implementation of SWORD and uses SWORD modules. FireBible has not been easy to develop and I had to face several challenges, right from implementing a new protocol to Unicode string management, Java integration, etc. The folks in #extdev over at irc.mozilla.org as well as the mozilla.dev.extensions group have helped a great deal. Mook, Moosop and Mark Finkle in particular. mitcho & satyr over in #ubiquity for assistance with Parser 2. My loving wife, Tanita, who allows me to spend my free time on FireBible instead of with her … sometimes. I’m Brian Fernandes, please see the about page for contact details. Bug reports and suggestions are encouraged and appreciated. …have used xulsword, and was very happy with it, until it broke after the latest Firefox 38.0 upgrade, while FireBible 2.0 seems to have the same status, at the moment, so my alternate program for Ubuntu is the Xiphos standalone. I just re-tested FireBible in Ubuntu and Windows and it works fine with Firefox 38.0.1 – what problem are you running into exactly? Thanks bro Brian. I just installed on Firefox with a number of Bibles and books. Will be trying to use it. Thanks for the good work you have done. And thank all those who helped you and sister Tanita. You can find me on FB, Google+, Twitter. Gnome Ubuntu 14.04.02, Firefox 40.0, FireBible 2.0b3, I Select Bible to download the library, it comes back with the message, (Error downloading LibSword. Please ensure you are online and try again.) I am online with a 120Mb connection. Any help would be appreciated. Mícheál, that’s very odd – if you open the console (Ctrl + Shift + J, I think) and then attempt to initiate the download, are any relevant errors logged? Also, can you go to ftp://ibtrussia.org/pub/xulsword/lib/ from within this same instance of Firefox, do you see a list of files named libxulsword-1.2.1-*? I wonder if you have trouble getting to the site from which the binary is downloaded. Brian, many thanks for your quick reply. I can see no errors logged. Entering ftp://ibtrussia.org/pub/xulsword/lib/ in Firefox after some time gives Problem loading page, The connection has timed out, The server at ibtrussia.org is taking too long to respond. The site could be temporarily unavailable or too busy. Try again in a few moments. If you are unable to load any pages, check your computer’s network connection. If your computer or network is protected by a firewall or proxy, make sure that Firefox is permitted to access the Web. I retried and get the same result. As I can access the Internet, it is not a network issue. I can access your web site. I have a direct Inter net connection so that rules out a proxy, I can access the Internet, stream audio/video, use Skype and download files and access other ftp sites with Firefox, that rules out the firewall. I have no idea. Note, I always run Firefox always in Private Mode, with HTTS anywhere and NoScript equally this does not affect anything else. Mícheál, well, that would explain why the download doesn’t work – FireBible attempts to download the native library from that site and you can’t seem to access it even through the browser. The site works perfectly here, 100% of the time – if you open that same URL in another browser or maybe the Linux file explorer (Nautilus? File Manager?) – are you able to access it? What if you go to http://ibtrussia.org/ in Firefox or in another browser, does the website open? I’ll look at a way in which you can download the library from elsewhere and place it in a location expected by FireBible; in the meanwhile, any reason why this domain would be blocked from your computer / location? Brian, I have even temporarily disabled ufw firewall in Ubuntu and this has made no difference, in either Firefox or Chrome, I cannot connect to ftp://ibtrussia.org/pub/xulsword/lib/. In reply to your question there is no reason for the domain to be blocked from my personal computer. Equally, I don’t see why it would be blocked from my location which is Europe or my ISP. Since you can access the domain but not the FTP server, perhaps you have the FTP port blocked? That’s port 21. To test, you could try another public FTP service like this: ftp://ftp.halifax.rwth-aachen.de/eclipse/ – does this open for you? This add on has been disabled because firefox could not verify it???????????? Hi Brian , I have spent hours trying to get firebible to display a bible text both in ubuntu 14.04 and windows 7 all to no avail . After selecting a bible then book and chapter nothing shows . In both instances I have used a new profile in case an addon was blocking it . Bob, unfortunately I missed you comment. There were some loading issues caused by changes in the Firefox API – sounds like the problem you describe. If you update to the latest version, it should hopefully work. If not, do respond here. Thanks for your reply . I have updated firefox to version 45 it was 43 and reinstalled firebible still without success . Have managed to sign your extension ? Can one disable the signature check for only one module ? Seb, it is now signed, do download the latest version and let me know how it works. Thanks! Firefox is blocking this app. It says the developer has to be verified or something like that. I was hoping it would work. Tony, sorry for the delayed response. The extension has now been signed and it should install fine if you try again. some time ago I could use FireBible, but after a certain update (Firefox or FireBible or both), It always wants to download libxul-1.3.1-WINNT_x86_64-msvc.dll. But immediately after downloading, Firefox crashes. Meanwhile I could download it manually. But where shall I put the DLL file to be used by FireBible? Thanks in advance for considering this problem. thanks for taking time to talk about it ! Thanks for thr suggestion to try the 32 bit version of Firefox. With this, it works fine. So, the problem seems to be an incompatibility with Firefox 64 bit. what if extension installs, libsword downloads, but the bible: abd sword: protocols are still not registered in ff – ?